(For an extra cost you can also request this on a CD). Our second set of Tables Tests powerpoints, with a fresh design. 100 powerpoints, each containing 10 questions, so twice as many as our first set - exceptional value for money. Questions appear on the screen at 15 second intervals, and at the end the answers appear, so that written answers can be marked. Click hereto download an uneditable sample (The actual files are fully editable powerpoint presentations). These can be used for pupils of any age or ability. 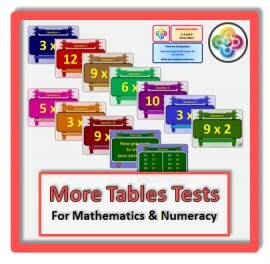 55 powerpoint tables tests, covering all combinations of 2 tables from 2 and 3 times tables up to 11 and 12 times tables. 24 powerpoint tables tests, each containing 10 questions from any tables up to 12 x 12.